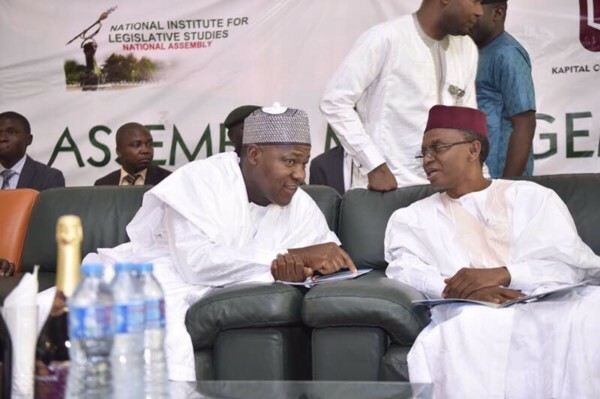 Kaduna State governor Nasir El-Rufai has described Speaker of the House of Representatives Yakubu Dogara as his kid brother, adding that he has no problem with him, TheCable reports. El-Rufai had repeatedly called on the National Assembly to publish details of its budget so their employers can know what the money is being spent on. Dogara had told El-Rufai to publish details of his salary and security votes, which El-Rufai did 3 days later and asked the legislative to do same. Dogara later published his payslips from October 2016 to March 2017, while calling on El-Rufai to focus on performing his duties as governor. He also accused El-Rufai of not publishing the state’s security votes. El-Rufai again responded to Dogara, saying that the National Assembly should not distract Nigerians demanding for details of its budget. I have no problem with the speaker, he is my kid brother. He respects me and I respect him, he told State House correspondents on Friday. It is in the national assembly’s interest to actually publish its budget because there are rumours of bogus amounts of money that they are getting which I do not believe is true. I think that the best way to kill that rumour is to publish the details of their budget but some people took exception to that call for transparency and I have no apologies because as citizens we have the right to demand for transparency for how resources are being spent. This N100 billion or so budget of the national assembly is money belonging to the people of Nigeria and every Nigerian has the right to ask and I am exercising that right as a citizen not even as a governor. I have no problem with the senate president, we worked together in the past, and I am confident that we will work together in the future in the interest of Nigeria but demand for accountability is not a problem and should not be construed to be undermining or any such thing. It is only someone who has something to hide that will do things like that and I don’t believe that the national assembly have things to hide,” he said.